MANILA, Philippines – Ilocos Norte Governor Imee Marcos pointed to former President Fidel Ramos as protests continue regarding the impending burial of her father, the late strongman Ferdinand Marcos, at the Libingan ng mga Bayani. 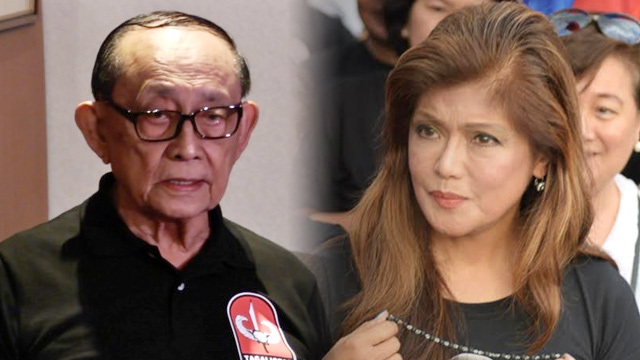 “Kami ay nag-aaral pa noon at mga bata pa. Bakit nga ba hindi natin tanungin ang dating Philippine Constabulary Chief Fidel Ramos tungkol sa mga pag-aresto at mga pang-aabuso diumano?” said Imee in a Facebook post on Monday, November 14. Among those who was disappointed with the High Court’s decision was Ramos, who was once Marcos’ vice military chief. “Address [the apology] to all the descendants of the victims, whether or not there is an investigation, to show sincere desire to discard, reject and eliminate already all the dictatorial tendencies and happenings during that period,” Ramos told GMA-7. The PC was the national police force that began under the American regime in 1901. It eventually became part of the military and was in charge of maintaining peace and order. The PC was merged with the Integrated National Police to form what is now the Philippine National Police. Imee also cited a February 2016 Manila Times column of Rigoberto Tiglao, who was among the activists arrested during Martial Law. “Rigoberto D. Tiglao of the Manila Times, who was a student activist, labor organizer, and ‘firebrand Communist’ (his own words), wrote last February, ‘Arrest orders against me and my late wife… were issued by Ramos,’ adding, ‘it was the PC’s top anti-subversive unit, the 5th Constabulary Security Unit… that arrested us, with one of their tall burly soldiers beating me up,’” said Imee. But Ramos and then-defense minister Juan Ponce Enrile broke away from Marcos following the 1986 snap elections, starting the series of events that led to the dictator’s downfall during the EDSA People Power Revolution. Both Imee and her brother, former Senator Ferdinand “Bongbong” Jr, are hoping the SC ruling would lead to “national healing.” Imee also urged her father’s critics to “let go” of their grudges. No legal admission of guilt? The Ilocos Norte governor also said that she cannot make a legal admission of guilt over the abuses committed during her father’s presidency. She said she was too young to remember at the time. “Mayroon daw nagsasabi na kailangang admission of guilt. Parang ang bigat naman kasi I’m not aware of any policy or any presidential order saying na kailangang gawin itong mga karumal-dumal na krimen,” she told ANC’s Headstart. “In my heart, if in any way you have hurt someone, you should say sorry even if it’s not intentional, even if it was not policy. Okay lang naman sa’kin, pero yung admission of guilt… Unang-una, ang liit-liit ko noon. Paano ko ia-admit, hindi ko naman alam?” she added. But Imee was already 22 years old on August 31, 1977, the day her national chairmanship of the Kabataang Barangay was questioned by 21-year-old Archimedes Trajano. Trajano was then forcibly taken from the venue by Imee’s bodyguards, and was tortured and thrown out of a building window.